I’ve decided to start “keeping the hours.” At least I’m going to try. Keeping the hours (or saying the offices) is a Benedictine monastic tradition of fixed-hour prayer. I may last one day, one week, one month – or I may decide this is the best thing I’ve ever done and do it forever. Well, the Benedictines are obviously Catholic, but they are also very disciplined and it’s the discipline I’m reaching for, not the Catholicism. What I’ve discovered in this year of change is that my disorganization is not just an external problem. I’m internally cluttered as well. And my spiritual life totally lacks organization. This is the reason I have started working on Centering Prayer, which is incredibly challenging but I keep trying it a few minutes each day. In spite of this, my quiet time with God continues to be haphazard, at best. I feel myself craving an order to my spiritual life, and so I’m attempting Keeping the Hours to see if it creates the form I’m looking for. I plan to say the words of the offices exactly at first, then move to a place where I keep the form but lose some of the rigidity. I’ll be keeping the Morning Office, Midday Office, and Vespers which basically means praying morning, noon and evening, and I’m using the book The Divine Hours as a guide. We’ll see what happens. My cluttered environment is simply a manifestation of the clutter within me. But I’m changing that – with clear-cut goals, ordering of my day, getting rid of extraneous junk, and structuring my spiritual life. I feel myself becoming new. I feel the old ways sloughing off. Yet change is something like turning an enormous ship. It’s slow (oh, so slow). It’s difficult. But as I turn, I see a new vista – a new horizon – a new me. And that, dear reader, is well worth it. It’s interesting what’s happened in the first months of my “project.” I started writing this little online journal as a record of all the organizational changes I was making in my home. Although there are lots of projects I can still do and am doing, and although there has been progress – the progress has been painfully slow and I find that it’s hard to stay motivated and excited about it. Not impossible – just hard. Really hard. But as I’ve gone through the process, I’ve unearthed something else that is really at the core of it all. I’ve unearthed my own discontent. Now, don’t get me wrong. I have many things to be happy about in this life, and I don’t take them for granted. I practice gratitude daily. But I realize that I’m a coveter. Coveting is just wanting something you don’t have, and I want all sorts of things I don’t have. The problem with wanting things and having goals to get them, is those goals can become little gods, the absolute be all and end all of each day. Lately, as I’ve become more aware of this general state of being, I catch myself thinking things that are really not productive. 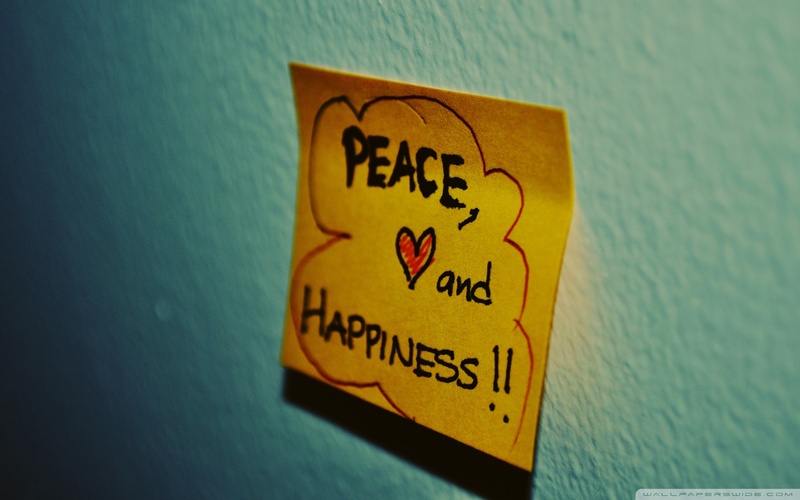 I find myself thinking that when my house is in order and running the way I want it to, I’ll be happier. Now, this may be true, but the result is that I feel LESS happy right now. It goes on all the time. 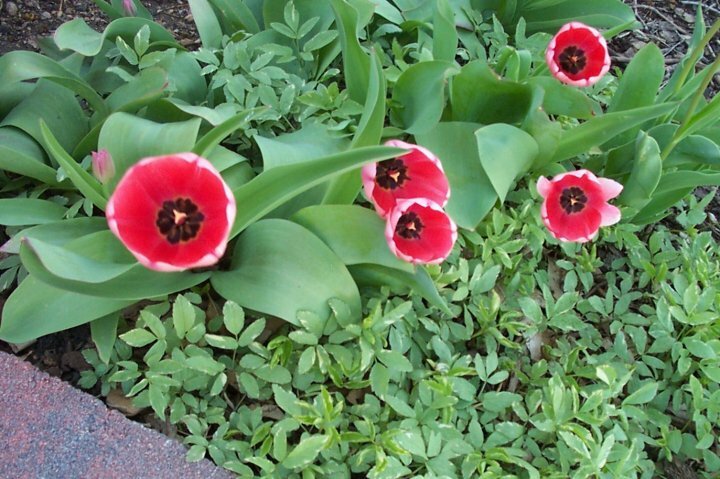 “If my yard were better, then…” Or, “The city’s making me crazy. If I just lived in a smaller town…” Or, “I need something that’s just mine (I can insert anything here, but career is frequently the word). Then I’d be satisfied.” Then just yesterday, I was on facebook looking at pictures of a phenomenal reunion between a friend of mine and the twins she gave up for adoption eighteen years ago, and instead of being overwhelmed with happiness for her, I’m sitting there thinking, “Wow. Look at her kitchen. If I had a kitchen like that…” Okay, I was actually very, very happy for her, but the kitchen thought did creep in. I’ve come to realize that I need to work on my contentment level. Paul in the Bible says that he has learned contentment in every situation, but I am so NOT there yet. I don’t quite know how to get there, but this I do know. It’s an internal issue. I can organize my whole house. I can throw out all the unnecessary junk. I can find my mission. I can lose thirty pounds. I can buy new clothes, remodel my kitchen, plant the garden I want – and still I will be dissatisfied if I cannot learn to be content where I am right now. I think that kind of contentment is somewhat supernatural. I know that it’s intangible. It’s this invisible thing I can’t quite put my finger on. But it’s essential. And so… I continue to do “the work.” I do the work of better fitness, better organizational systems, better planning. I also do the internal work that leads me toward greater simplicity and true contentment. In pursuit of these things, I’ve changed some aspects of my day. I’ve started the discipline of centering prayer, the purpose of which is to practice being in the presence of God. Of course, I’m centered on the Lord for about two minutes before I catch myself mentally making a grocery list, but the key word is “practice.” I keep bringing myself back to the stillness in which I can know God, and it will get easier as I do it more. I’ve also been repeating the Jesus Prayer several times a day – “Lord Jesus Christ, Son of God, have mercy on me, a sinner.” I focus on the meaning of each of the four parts. I recognize the lordship of Jesus, I express my faith that He is who He said He is, I acknowledge my own position in relation to Him, and I receive the grace He freely offers me. When I do this consistently, well – my goodness, if all else doesn’t dim in comparison. And then, I continue to practice gratitude. Thank you that I am alive. Thank you for the richness of my relationships. Thank you for the freedom to express myself. And thank you for the power to change, which resides in me. I truly love spring. I love the newness of life. 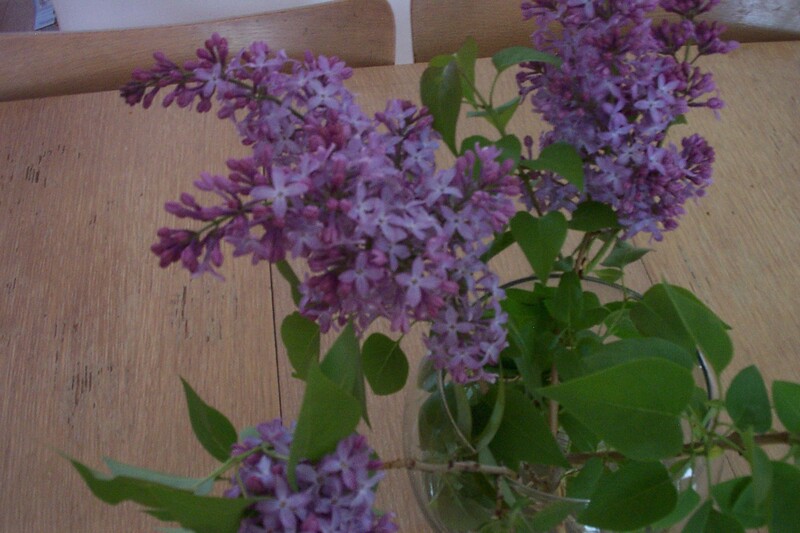 And I love lilacs, which I’ve brought into the house, along with their delicious fragrance. As an aside, some people don’t realize that because of their woody nature, you have to pound the cut end of the lilac branch with a hammer, splitting the wood and creating more surface area for the branch to draw water. Otherwise, these beauties will wilt within a few hours. Today has been a “day in the life.” Nothing spectacular has happened. We put grass seed on bare patches in our front yard (and by we I mean my husband). Normal household chores are being done. And I am facing projects that involve sorting – sorting and organizing, my least favorite things to do. I wish I could be passionate about homemaking. It would make my whole life happier, because that’s what I find myself spending the most time on. My problem is that I don’t feel passionate about these things I do. I feel that my whole existence requires me to operate in my area of greatest weakness and so I’m constantly falling short. (If this sounds like a familiar theme – it is. I continue to struggle with this same issue). There is a blog written by a young woman called -of all things – Passionate Homemaking. She has hundreds, maybe thousands of readers, so she clearly resonates with people. But when I read her stuff, I find myself feeling like we are living in two absolutely different spheres. I can’t even try to run my home like she does. I wish I could – she says she’s loving simple, natural, intentional living. Who wouldn’t want that? I am a dispassionate homemaker (I guess). Of course, I have to run my home, I just don’t have it in me to be Martha Stewart. I suppose it’s not my mission. The question I have about missional living is this: how do you find your mission when you feel like you’ve been sidetracked and you’re not even sure exactly what you’re looking for? Fleshing out this question this week, I’ve been reading “Flunking Sainthood” by Jana Riess. This is more my speed (compared to the aforementioned blog) because this woman is far from perfect. Each month she attempts a different spiritual practice, and in falling far short of her goals, learns some valuable life lessons. During one month in a chapter she calls, “Meeting Jesus in the Kitchen … or Not,” she studies Brother Lawrence (some monk from days gone by who did all of his monkly work in the kitchen) and works on mindfulness – being fully present in what she’s doing and thereby finding her creator in those daily tasks. Brother Lawrence was never made a saint by the Catholic church, and the author at one point says, “It suddenly strikes me why I’m so sensitive about Brother Lawrence’s lack of official saintly creds: He’s an underappreciated housewife, the one everyone takes for granted. He’s … a bit like me, and like a whole lot of people I know.” This is a work in process for me – finding my creator in tasks I despise. I simply have to say to myself – I work so hard, and I’m making change, and it’s possible the only one who sees it at all is God. And that must be enough. Don’t get me wrong. I’m doing it for me, too. I’m doing for my family. And I’m hoping along the way that I trip over my mission in all the clutter. Once, at the women’s Bible study I go to twice a month, I was bemoaning the drudgery of running a home. No task is ever completed. One does the same things over and over and over. I sometimes feel that I was created for something else, something that would use what I perceive as my giftedness. But instead, I’m asked to operate in the area of my greatest weakness all the time by managing a home and educating my children, activities which require organizational and administrative skills that are in want. Well, a very wise friend gave me this advice that day. She said I should live life like a monk. She said that everything my hand finds to do, I should do as an act of worship to God. In that moment, I felt my perspective shift. If those things I find painful and occasionally mind-numbing, actually bring glory to God, well… it gives them infinitely more value. But the clincher is this – if God really receives those actions as acts of worship, then the act itself takes on a spiritual component. Doing the laundry becomes quietly honorable, because no one else may see it for what it is, but the Lord does. Laying aside what I want to do, in order to do what must be done, becomes not just a sacrifice, but a sacrificial act of worship. Life is conspiring against me today. It really is, and I’m sure every one of you can relate to that statement. For instance, I had planned on barbecuing a chicken outside today, because it’s a balmy 70˚ – truly beautiful Colorado weather. (Tomorrow will be 40˚ and snowing, which is also beautiful Colorado weather, in its own way). This involves cutting up a whole chicken – which I was sure was in my chest freezer. I was sure and I was wrong, so we had to do something else and this involved a trip to the store (which my husband did, bless his heart). I realize this is not catastrophic. But then, I sat down to write my business blogs. These are scheduled posts that are mapped out a month in advance and clients pay for them, so there’s really very little wiggle room. After one post, my DSL connection disappeared. No internet. I unplugged the modem, unplugged the router, re-booted everything. No internet. So I called the provider and they couldn’t even check the connection because it was reading “error” on their end. Twenty minutes on hold, three phone calls, and two hour later – the internet’s back. My work is done, and it’s all okay, but my afternoon got totally jacked, if you know what I mean. I realize this is not catastrophic either. But then, the lovely woman who comes in once a month on Thursday to scrub down my home, called and asked if she could come tomorrow (Wednesday) instead. This is fine, except the day before frenzy that I usually go through and had planned on doing Wednesday, had to get done today when my afternoon got jacked (see above) and I didn’t really have time for it. Okay – this is not really catastrophic either. 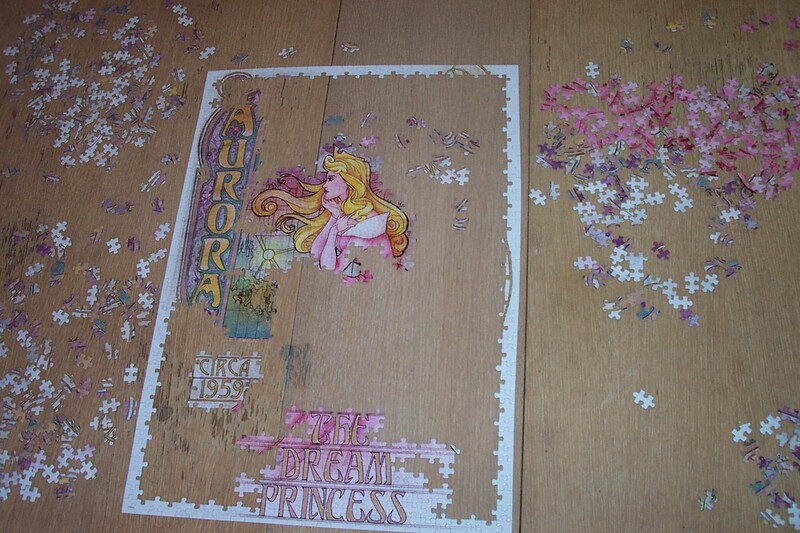 None of it was, but piled up together, I found myself wishing that something could go smoothly. But isn’t that life? Life is bumpy and things frequently don’t go according to plan. What I realized today is that as long as my heart is at peace (which it is) everything else tends to come out in the wash, so to speak. I also had two beautiful epiphanies today. First, I was inspired to clean out my chest freezer and create an inventory list so I know what’s in it without opening the lid. I will cross things off when I take them out, and add them when I put them in. Never again will I be searching for a chicken in the bottom of my freezer. Second, although I still had a day before frenzy, it was more like half a frenzy. The main floor living area required absolutely nothing. Well, almost absolutely nothing. Everything was put away except seven pairs of shoes. All the sprinting happened upstairs in the bedrooms and the office/schoolroom. This was thrilling for me, because I know that I know that I know that the work I’ve been doing is having an impact. If I keep taking back my life ten minutes at a time, I will achieve a peaceful home environment, one to match the peace in my heart. I noticed something today, and it’s quite fabulous. I was able to measure my progress. My little one has a friend over spending the night tonight. In the past, when someone’s going to come over, it has been a sprint to get everything picked up and ready. Not so today. Because of the 10-minute tidy, and because I’ve been successfully keeping my sink and stovetop clean, there was nothing to do. So we spent 20 minutes running the vacuum and cleaning the bathrooms, and we were ready. Totally stress free. Since the bathrooms were cleaned this morning, I figure it’s as good a time as any to implement the 90-second hard surface clean in both the bathrooms. This will be every day upstairs, where we all do our bedtime and morning preening; and every other day downstairs, where a lot less happens. I was going to wait until I’d finished organizing the bathrooms, but couldn’t think of a good reason. Why procrastinate, after all. For those who are wondering, the 90-second hard surface clean includes buffing out spots on the mirror with a microfiber cloth; wiping the vanity, faucet, outside of the toilet, and rim of the tub with a chlorine-free cleansing wipe; and doing a quick swish with the brush in the toilet bowl itself. I estimate this takes about 90 seconds, but haven’t actually timed it. Feng-shui the dining room table. Of course, I’m not currently feng-shui-ing the table because of the beautiful Aurora, who has taken up residence. I thought I’d share our progress with you, dear reader, since progress is what today’s all about. Well, today I dealt with some ickiness, and by ickiness I of course mean organizing. There is something about the actual act of deciding (store, throw, give, keep) that I truly abhor. I don’t know if this is psychological, but probably it is. It’s probably based in some poverty mentality, and deep in my sub-conscience I think that if I let go of something, I’ll be left with nothing. So I tell myself, “I have plenty. My God shall supply all my needs according to His riches in glory in Christ Jesus.” The problem is (of course) believing it. So today I continued to work on my backlogs. This includes laundry, which is down to hand-wash delicates that must line-dry, and today I washed three. The other is paper, and I did one small pile (shred, file, throw). Then I decided to start in the bathroom. The truth is, I’m basically a chicken. I’m slightly intimidated by what needs to be accomplished in my house, and the bathrooms are the easiest rooms to start with. Today, I did the medicine cabinet upstairs. This is how it looked. And this is how it looks now. All the things in here that weren’t here before were on my counter. It was so cluttered. 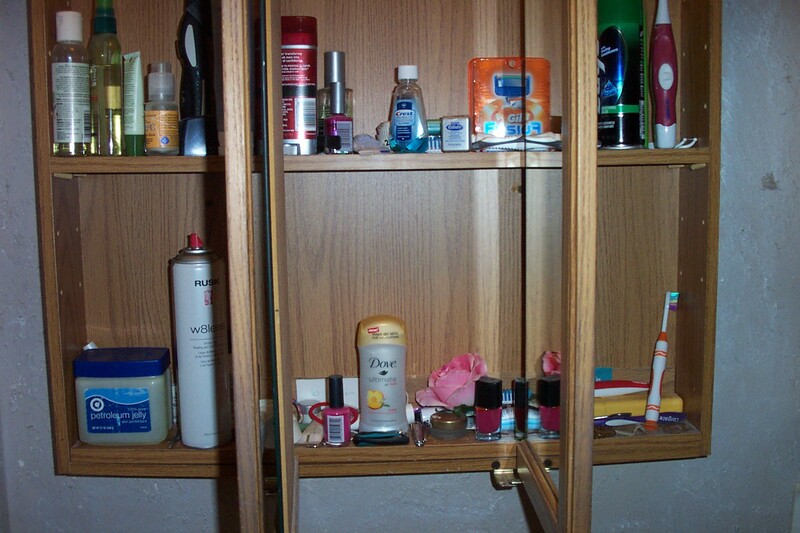 Now, the only things on it are hand lotion, hand soap and two small jars with Q-Tips and cotton balls. Many, many things got thrown away (like expired medicines and almost empty cosmetics). 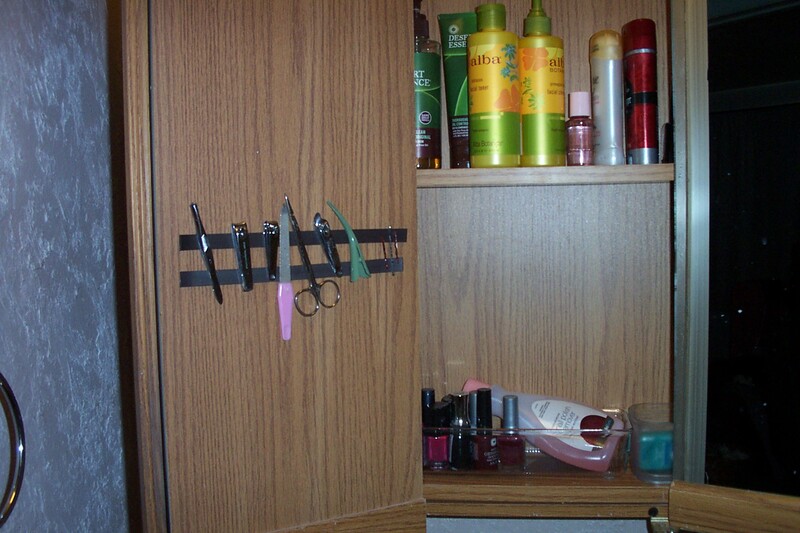 This is a magnetic strip for nail clippers, scissors, and tweezers. Never again will I be digging around for these things. I was thrilled to discover that bobby pins stick to the strips, because I used to have so many that are now all lost. I’ll put up a strip just for bobby pins if I need to. By the way, this idea is not original with me. I’m just not sure where I ran across it. However, not long ago, I was shopping at IKEA and I saw a system where metal tins of herbs were stored on the wall on magnetic strips, and I thought – I’m doing that! (I may actually do that in my kitchen, when I get there). Overall, I’m pleased with this. Very little effort has resulted in a major change. 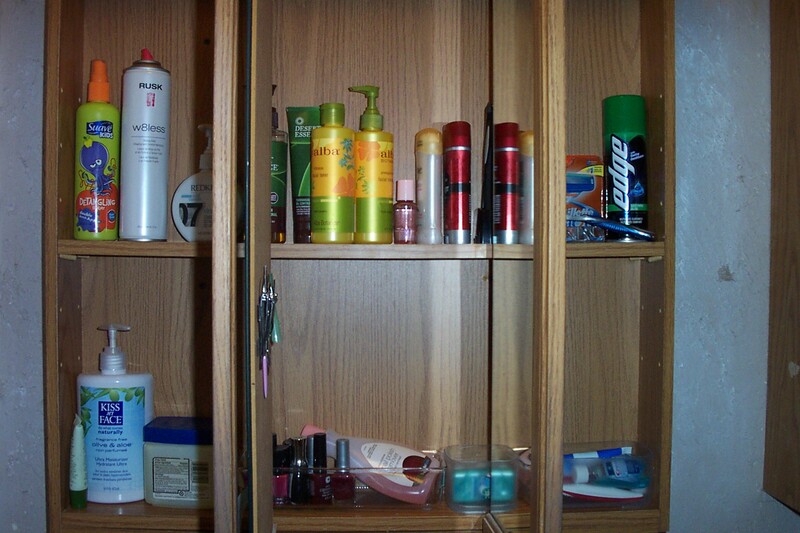 When both bathrooms are completely organized, I’m going to add a hard-surface clean to my daily routine. This will include wiping the vanity, the outside of the toilet, the mirror and a quick swish in the toilet bowl with a brush. I estimate this will take about 90 seconds for each bathroom, so in three minutes a day, I can keep my bathrooms looking fresh and tidy. Each step encourages me to take the next. And each day the lesson is reinforced – little steps consistently taken in a positive direction have a cumulative effect. I’m starting to see changes. I’m implementing systems that work. And each day, as I do the work, the life I am living becomes new.